In each year of the cooperation, ESA and NRSCC will organise thematic training courses in China. The aim being to train the next generation of principal investigators in the expoitation of ESA, ESA TPM, Copernicus Sentinels and Chinese missions' EO data for science and application development. Since 2004, more than 1000 Chinese and other Asian Ph.D. and M.Sc. level students have attended advanced training courses in land, ocean, atmosphere and terrestrial water applications. 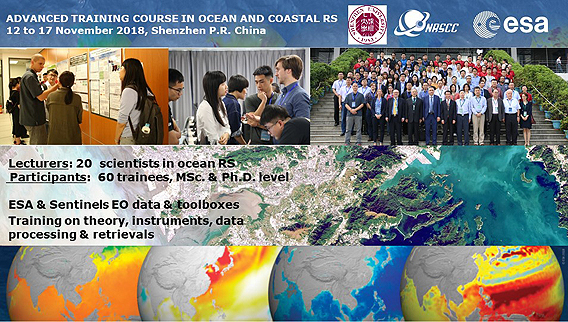 The 2018 training course in ocean remote sensing was hosted by Key Laboratory for Geo-environment Monitoring of Coastal Zone of the National Administration of Surveying, Mapping and Geo-information, Shenzhen University (GEMCO, SZU), P.R. China. The training course was taught by 20 European and Chinese ocean experts and was attended by 60 trainees. The course provided hands on practical training and theory for exploitation of Sentinels 1, 2 and 3 data, ESA Earth Explorers and Chinese EO data for oean science and applications. 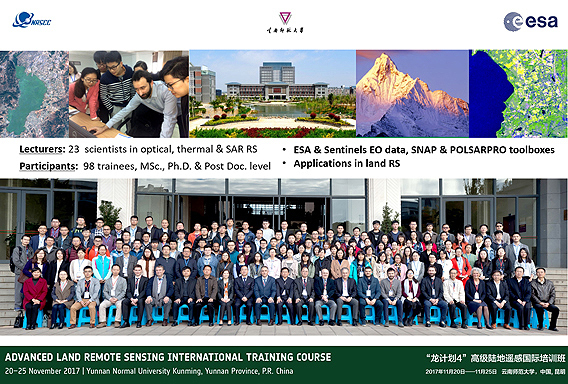 The 2017 training course was on land remote sensing and was held at Yunnan Normal University in China from 20 to 25 November 2017. The course focused on exploitation of Sentinels 1, 2 and 3 data for land applications as well as Chinese and TPM data. 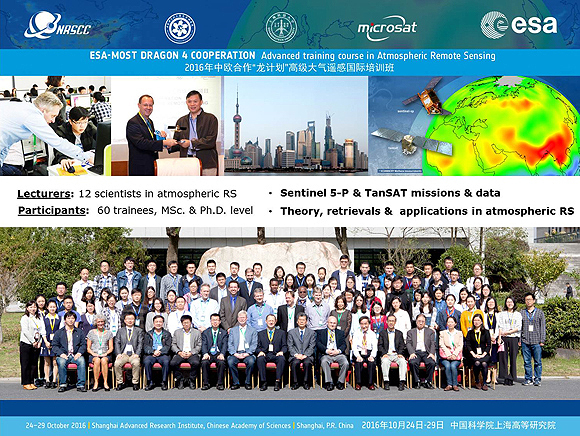 The 2016 training course in China was on atmospheric remote sensing and focused on exploitation of Sentinel 5-P and TanSAT data. The course was held at Shanghai Advanced Research Institute, Chinese Academy of Sciences, Shanghai from 24 to 29 October 2016.